Those who know me well know that I am at my happiest when I’m planning my next vacation. There may be a scientific reason behind this, but I just know that I adore planning trips. And going on them, too, of course. We’re headed to Las Vegas in June, and I’m getting more and more excited about it. I’m not the gambling type — I’d rather get a sure thing for my money — but Las Vegas is such a great city for entertainment, food, people watching, shopping. And did I mention shopping? And food? But guess where else I’m going. Go on. Guess! I’ve been to Seattle as a kid, maybe when I was around ten or so. I have a handful of memories of Seattle from way back then — eating bagels with cream cheese and smoked salmon, watching the salmon swim upstream through the locks. I also remember rain, lots of rain. I can hardly wait to see the city again as an adult. And to top it off, I get to attend a fantastic conference with lots of other people who all love food and writing as much as I do. 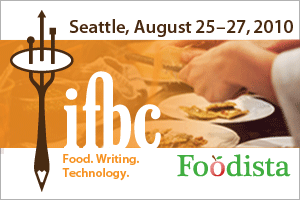 If you’re also interested in attending the IFBC, general registration opens on April 19th. Hope to see you there! Our weekday routine is so hectic – with work, school, swim practice, and random errands that must get done – that we rarely sit down to a real family dinner during the week. I have a wonderful babysitter who picks my kids up from school three days a week, and on those days, the kids eat dinner with the sitter before my husband and I get home from work. By the weekend, my maternal guilt has usually set in nice and strong, and I feel the urge to bring everyone together for at least one good meal together. Sounds lovely and peaceful, right? The four of us seated at a beautifully set dinner table, a home cooked dinner on our plates, pleasant conversation about life and the issues of the day. Smiles and happy faces all around. Add some violin music, and it would be perfect. Of course, it rarely – if ever – happens that way. Not in my house, anyway. Our version usually involves less peace and harmony and more whining and complaining from the kids, begging and pleading from me, and general annoyance and frustration by about ten minutes into it. The meal usually ends with me wondering aloud why I even bother. This past weekend I attempted the family dinner again. 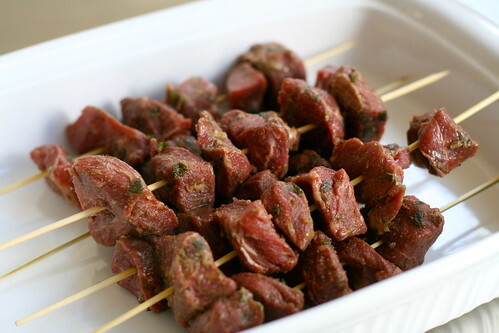 I made a recipe from the August 2009 issue of Gourmet for cumin-scented beef kebabs. The recipe turned out great. The marinade was incredibly flavorful. 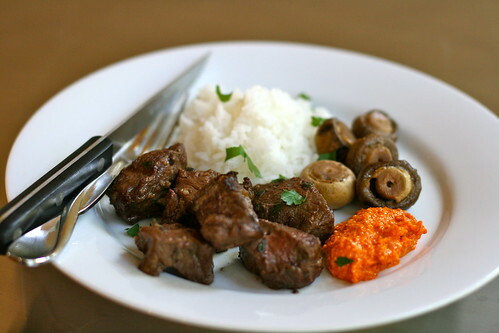 The combination of the oregano, cumin, coriander, garlic, and cayenne was delicious. The family dinner did not quite go as I had planned. Our gas grill ran out of gas as the meat was finishing up. When the gas ran out, the steak was only cooked to medium rare, a bit too rare for our tastes. The beef cooked a bit more as it rested, so most pieces were cooked just right. 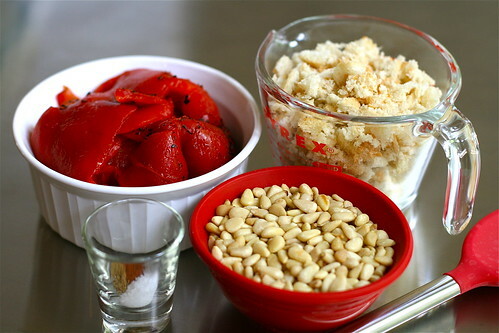 My kids refused to eat the roasted red pepper and pine nut dip that I served on the side. It was a great sauce for the beef and the mushrooms, but Madeline and Oliver wanted no part of that. 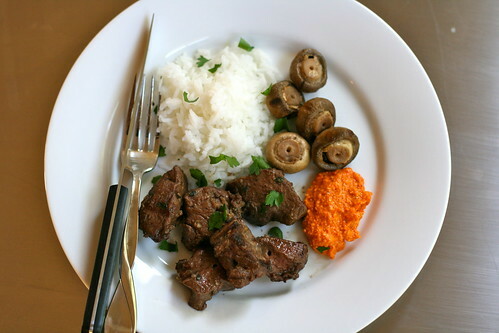 The grilled mushrooms were so tender and wonderful, but I couldn’t get either child to try even the smallest bite. A small consolation was that they did eat the jasmine rice and the beef. But I will still continue to try. I’m determined that if I make a habit of the family dinner, the kids will eventually forget that they don’t like eating non-brown, non-hot-dog-shaped food. I’m a believer that one day they’ll look forward to the ritual of it. And hopefully they’ll look forward to my food, too. Since I followed the recipe exactly, I won’t duplicate it here. If you’re interested in trying it, this is where you can find it. I thought it was really tasty, definitely worthy of making again. My husband and I love entertaining, but the sad truth is that we just don’t do it very often. Until about two years ago, we lived in a very small house and it never felt right for entertaining. The hang up was probably all mine, in retrospect. I felt very cramped and claustrophobic in that house. Add in a handful of other people and I just wasn’t a happy hostess. We moved into our current house just shy of two years ago, and it’s much bigger, with plenty of room to entertain. I even hosted my work Christmas party here last year and it went really well. Plenty of room to spread out and — the biggest upside — I never felt cramped. We finally have the space to entertain, but now there are lots of other reasons why we don’t host more parties. Our two children are at the top of the list. We hate to disrupt their schedule, you know? Then there is the time factor. It’s hard to entertain when you work all week and really only have the weekends to prepare. And then, the house is always messy, so who could possibly entertain when the house is never clean enough, right? I know, I know. These are all just sad excuses. I get that. The kids are much more adaptable than I give them credit for. It doesn’t really take THAT much time to prepare for a party, and a lot of it can be done in advance. And, the truth is, if we set a date for an event, the house WILL be clean by then. It just will be. My husband and I have made a pledge to ourselves to at least start off with hosting a dinner party or cocktail hour sometime soon. Of course, no date is set yet, but we’re working on it. 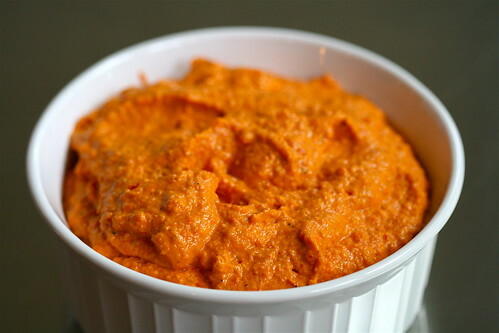 In the meantime, I made a favorite appetizer last weekend – roasted red pepper dip. A few years ago, I made the recipe in the The New Best Recipe cookbook, and I really liked it. 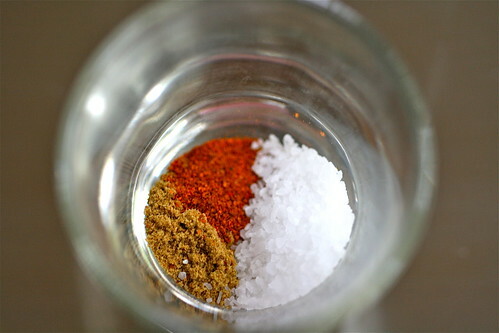 This recipe came from Gourmet magazine, the August 2009 issue. It’s very simple and takes just a handful of minutes to throw together. 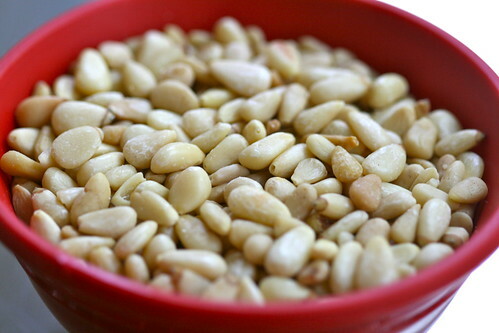 The only change I made was to use pine nuts instead of walnuts. This dish can also be made up to three days in advance, a real bonus if you have all the entertaining excuses that I have (see above). I’ll definitely make this one again. I think that the color is very striking, but it scared the kids off. They refused to eat it, or even taste it, because of the reddish-orange hue. I think that if I served it with hot dogs, they might have tried it, but then again, maybe not. Perhaps they’ll eat non-brown food once they are teenagers. My fingers are crossed. 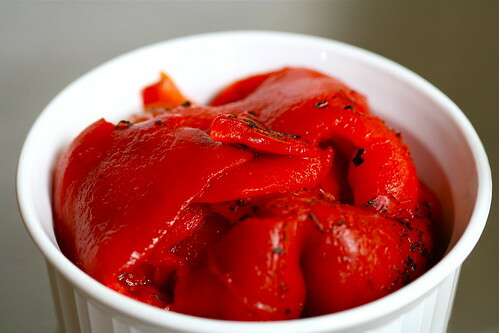 I’d love to know about your ideas for great make-ahead appetizers or recipes for entertaining. Any favorite go-to recipes or tricks of the trade? 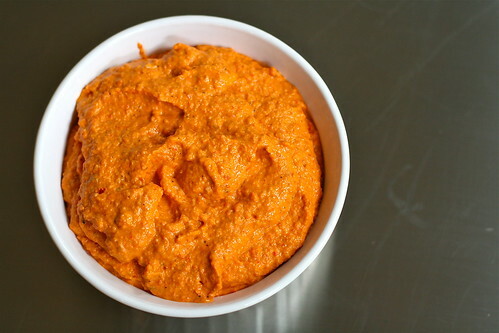 Puree all ingredients except for the olive oil in a food processor until blended and almost smooth. With the food processor running, add olive oil in a slow stream until fully incorporated. Only slightly adapted from Gourmet, August 2009, recipe here.